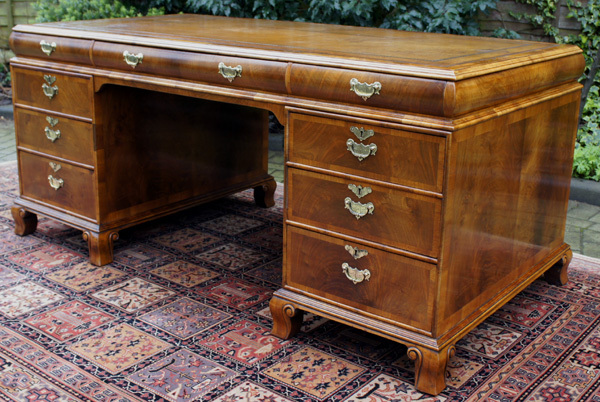 This beautiful antique, George 1 style, figured walnut desk recently been sympathetically restored enhancing its beautiful honey coloured patina. It is a stunning quality desk with cross banded edging and original honey coloured leather writing surface with blind and gilt tooling. The desk is made in three sections for ease of transportation and installation. If you are interested in this Antique Pedestal Desk please contact us quoting reference: SN619. 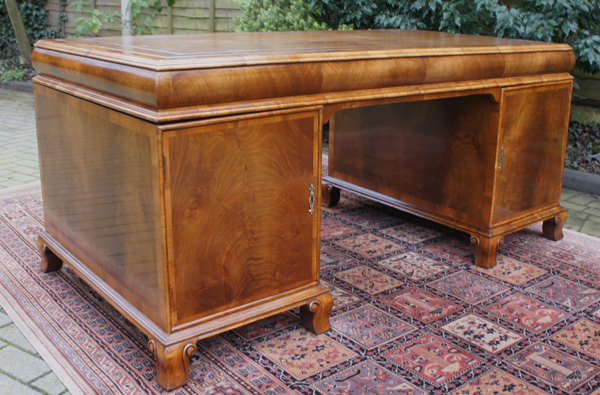 This beautiful antique, George 1 style, figured walnut desk recently been sympathetically restored enhancing its beautiful honey coloured patina. It is a stunning quality desk with cross banded edging and original honey coloured leather writing surface with blind and gilt tooling. and have the original brass handles and each pedestal also has three drawers. All of the drawers are constructed with hand cut dovetail joints and the original brass locks. The front edges of the drawers are cross-banded in walnut. The reverse of the pedestals are fitted cupboards with an interior shelf. and block moulded detail and raised on walnut ogee bracket feet. 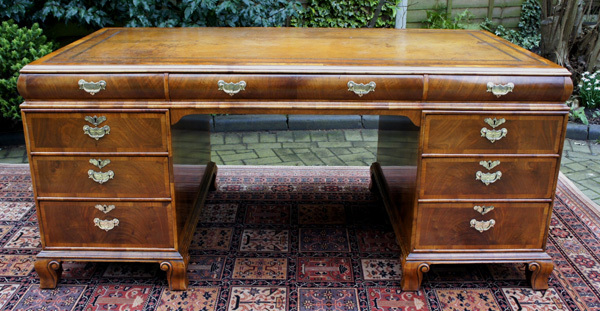 This is a stunning and very stylish antique desk that would suit an Art Deco styled room or a contemporary office. It is in excellent condition and has recently been professionally cleaned and re-polished ready for use.